Other members of the Artemus Labs team are CSULB students Anna Maria del Mundo, management information systems; Nikki Escobar, industrial design; Kimberly Ventura, aerospace engineering; and Calvin Leung, a CSULB marketing and management information systems major who was on finalist teams in 2017 and 2016. Long Beach Mayor and CSULB alumni Robert Garcia, fresh from a reelection win, congratulated all four teams for their contributions. “Thank you for engaging and creating such good ideas,” he said. The three other teams were Battery Effect, which has developed a household battery-recycling business; Gravity Ball, which is marketing an exercise ball for people who have difficulty gripping things; and StickUp, an augmented reality app available in the Apple and Google Play stores. The Battery Effect team was headed by Alexander Galasso, who graduated from CSULB with a marketing degree in fall 2017. 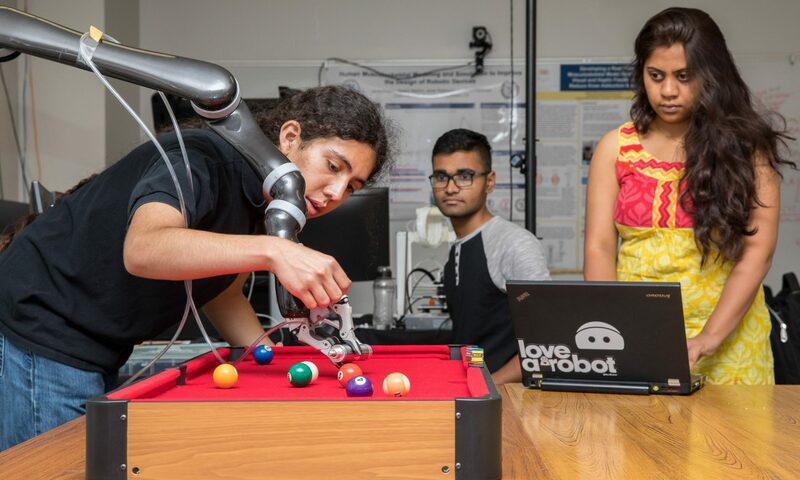 Team members are software developer Leon Smith II; Abhishek Manjulagodu Basavanna, who is working on a master’s degree in aerospace engineering; and Madison Simon, a CSULB marketing major. The Gravity Ball team was led by Vandana Vaswani, who is in CSULB’s MBA program. The Gravity Ball was invented by Dr. Mark Chavez, the company’s president and chief health officer. Nicole Tolmie, who holds a bachelor’s degree in cultural anthropology from University of Washington, serves as Gravity Ball’s business and content manager. Irene Luna Guzman is the company’s strategic adviser. StickUp was led by founder Bryan Amburgey, who also founded two other augmented reality startups, ARLB and ARTV. Team members are CSULB graphic design majors Samantha Surtandi and Annie Lee, and video editor Sam Maliszewski. StickUp lets users create augmented reality targets at their home, school, or favorite coffee shop/bar, and then anyone with the app can add content to those targets like selfies, videos, 3D text, and more. Besides Niggli and Platnick, the judges were Alexa Fleur, president and founder of CritiqueIt; Studio One Eleven Founder Alan Pullman; and Walter Larkins, CEO of Sapphire RCMS. Established in 2010, the Innovation Challenge is an opportunity for undergraduate and graduate students from across the university to use innovation and entrepreneurship to make a difference in local and global communities. Teams are matched with mentors from the business community to craft winning business plans. This year the contest received letters of intent from 41 teams, 17 of which submitted business plans. The final four teams were selected from eight semi-finalists. For more information, visit csulb.edu/innovation-challenge.